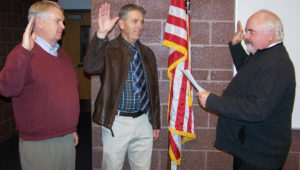 Paul Gottfredson swears in Kim Pickett (left) as South Sanpete School Board president for two years and Grant Hansen (center) as a new board member during the recent school board meeting in Manti. MANTI—The South Sanpete School District (SSSD) wants to prepare high school students for computer science careers. Career and Technical Education (CTE) was a major focus at the monthly SSSD board meeting last Wednesday, Jan. 11. The discussion started during the previous meeting with a request from Ephraim business owner Craig Oberg to coordinate technical training of students to meet his business needs for qualified employees. 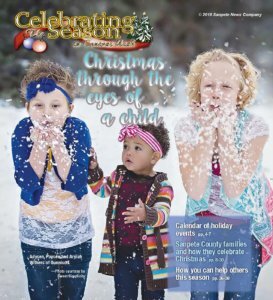 Mark Anderson, the CTE director for several Central Utah school districts, said he had followed up with Oberg on coordinating computer science programs with the high schools and Snow College. “I have no trouble hiring people to push brooms, but it’s harder to find qualified people who can handle our AutoCAD programming,” Oberg told Anderson. Oberg’s CO Building Systems designs and builds steel buildings all over the world, and is based in Ephraim, across from the Snow College west campus. Oberg says he needs employees who are properly trained in computer-aided drafting and have confidence in themselves to do the work. Anderson told the school board that, when it comes to CTE class offerings, Manti High currently offers 12 and Gunnison Valley High offers 10. He also said a new North Sanpete High School teacher is doing a class in advanced placement science, with Snow College assisting. “We know public education needs to prepare students for a changing workplace, and computer programs are a big part of that workplace,” Anderson said. In other action, the board swore in new board member Grant Hansen, who replaced Kathy Frandsen. Kim Pickett, who will serve as president of the board for the next two years, was sworn in as well. Mark Olson was chosen to serve as vice-president. Business administrator Paul Gottfredson confirmed the district’s compliance with transparency requirements, demonstrating on public websites where anyone can see the complete financial budgets, expenditures and income of the district. Relating to budgets, District Superintendent Kent Larsen reviewed legislative issues affecting public education, including a new initiative by a Utah business consortium called “Our Schools Now” to increase taxes and raise $750 million for education. The group says if the legislature doesn’t respond to the idea, it may try to get a proposition on the next election ballot. The board also discussed the district’s status relating to student injuries. One category where the district has above average number of student injuries (compared to the state average) is in seven to 12-year-olds. The board considered causes of injuries, and ways to improve student safety in schools. The board also reported on training they received at a recent Utah School Board Association convention for board members in January. The next board meeting is scheduled for Tuesday, Feb. 7, at the Ephraim Middle School.